Like the majority of gobies, several oxudercine gobies lay eggs inside burrows guarded by at least one parent (usually the male). Specific details of the courting behaviour and parental care activity that presumably take place inside the burrows have not been studied so far (Kobayashi et al., 1971; Brillet, 1976; Lee & Graham, 2002). 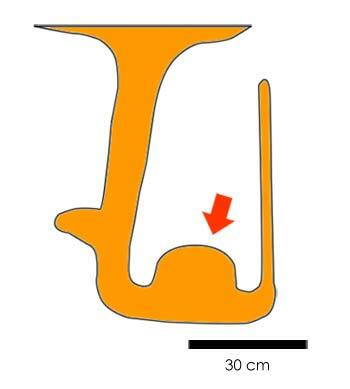 The capacity to maintain an air phase in egg chambers inside burrows has been demonstrated in some oxudercine species (Scartelaos histophorus: Lee et al., 2005; Periophthalmus modestus: Lee & Graham, 2002; P. chrysospilos, Periophthalmodon schlosseri, Boleophthalmus dussumieri, B. pectinirostris: Ishimatsu et al., 1998, 2000; P. sobrinus= P. argentilineatus or P. kalolo: Brillet, 1976). This behaviour is probably connected to the necessity to remain inside submerged burrows in almost anoxic water during part of the tidal cycle (see also Bimodal Respiration). Yet it does also seem to play an important role in the development of their eggs inside burrows. In Pn. schlosseri the maintenance of an air phase inside their burrows has been considered an integral part of the parental care (Ishimatsu et al., 1998). In the laboratory, eggs of Periophthalmus sp. can develop in well areated water (Ishimatsu et al., 2000), or by means of periodic exposure to air (Brillet, 1976). In oxudercine gobies, AG (Air Gulping) and the transport and maintenance of an air phase into burrows therefore, seem to be crucial preadaptations for the colonisation of anoxic muds in intertidal tropical mudflats. Adult of Periophthalmus malaccensis nearby its burrow. This species can be recognised in the field from the elongate first spine of its first dorsal fin. Note the turrets built around the two openings. Wawontulap, North Sulawesi, 2005. 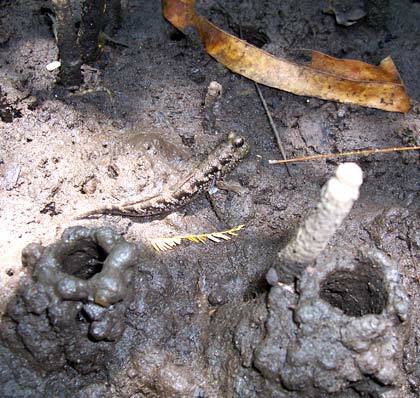 Architecture of a burrow of Periophthalmodon schlosseri (Penang, Malaysia). Drawing based on casts and direct measurements. The air phase is maintained in the dome-shaped chamber shown by the red arrow. It should be noted that some researchers proposed that some species of Devonian semiaquatic tetrapods lived in intertidal habitats (see also Introduction and Fish Coming Ashore); on the other hand Orton (1954) suggested that burrowing in soft	sediments may have been one important ancestral function of tetrapod limbs (Clack, 2002; Carroll et al., 2005). As a matter of fact, it was precisely during the Devonian period, when ancestral protoamphibians were about to emerge from water, that big deposits of mud with a high organic content began to accumulate in alluvial and intertidal systems colonised by the first semiterrestrial plants (see also The Devonian Opportunity). While virtually all extant amphibians need the presence of environmental water for the development of their eggs, oxudercines need environmental air for exactly the same reason. In these benthonic burrowing fishes, anoxic sediments seem to have exerted the principal selective pressure that led to the exploitation of air as a concentrated source of oxygen (see also Bimodal Respiration). 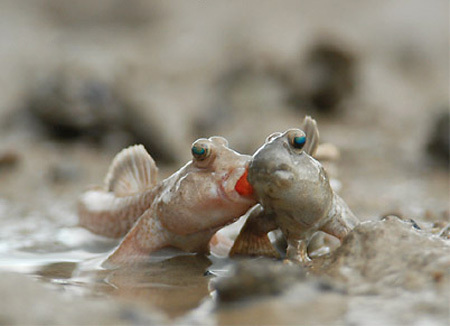 Burrowing seems to be a fundamental preadaptation to semi-terrestriality in mudskippers. There is no fossil evidence of burrowing behaviour in any of the earliest Devonian tetrapods. 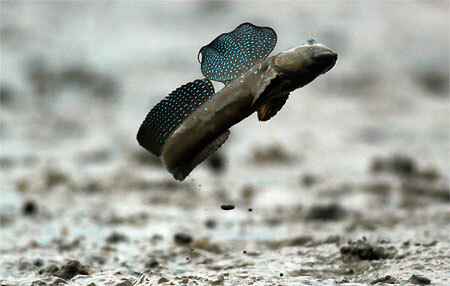 Nonetheless, mudskippers appear to suggest an interesting process for the evolution of eggs capable of enduring dehydration in air: the latter being a fundamental step to the vertebrate invasion of land (Long, 1995; Long & Gordon, 2004). Courtship behaviour has been described for a very limited number of species: Periophthalmus sobrinus= P. argentilineatus or P. kalolo (Brillet, 1970; 1976; 1980b; 1984a); P. chrysospilos	(Macnae, 1968; Polunin, 1972); Scartelaos histophorus (Milward, 1974); and Boleophthalmus dussumieri (Clayton & Vaughan, 1988). Several elements of the behavioural sequence closely resemble elements of aggressive or agonistic behaviours (Brillet, 1980b). In all observed species though, this sequence presents some peculiar traits. At first the male digs a burrow within a territory which is actively defended from conspecific males and other intruders (crabs, other mudskippers, etc.). The egg chamber, dug in a horizontal branch of the burrow, is characterised by a smooth and vaulted ceiling: it is here that an air phase is maintained. The male then tries to attract any females that cross its territory by means of various displays. To do so, it exhibits specific and intense coloration of its body and fins (dorsal fins and in some cases also the caudal fin), typical body postures (e.g. dorsal arching and dorsal fin erection), and energetic movements (e.g. vertical jumps and body undulations: see also Vision & Mechanoreception). A scarcely ritualised phase ensues (though the sequence can still be interrupted), during which the female follows the male towards the entrance of the burrow (promenade nuptiale: Brillet, 1984a). Finally the partners enter the burrow, where eggs are laid and fertilised. In a study made during the reproductive season of P. sobrinus (= P. argentilineatus or P. kalolo) Brillet (1976) found burrows containing laid eggs only ever had males present; whereas burrows that held no eggs were host to (in order of decreasing frequency) males, females, and finally couples (Brillet, 1976). In Scartelaos histophorus a pair is guarding the territory and cohabits in their burrow (Townsend & Tibbetts, 2005). Probably in the majority of oxudercine species (as in the majority of gobies: Miller, 1984, 1986), it is the male that guards the eggs, the cohabitation period of partners being relatively short. Periophthalmus modestus (Ariake Sound, Southern Japan, 2003). Boleophthalmus pectinirostris (Ariake Sound, Southern Japan, 2003).